The village of Layham lies just 2 miles to the South of Hadleigh and the parish church, St Andrew's, is one of the three churches in the Hadleigh Benefice. Given the short distance and the nature of life in this part of Suffolk, there are long established and very close ties between the village and the town. 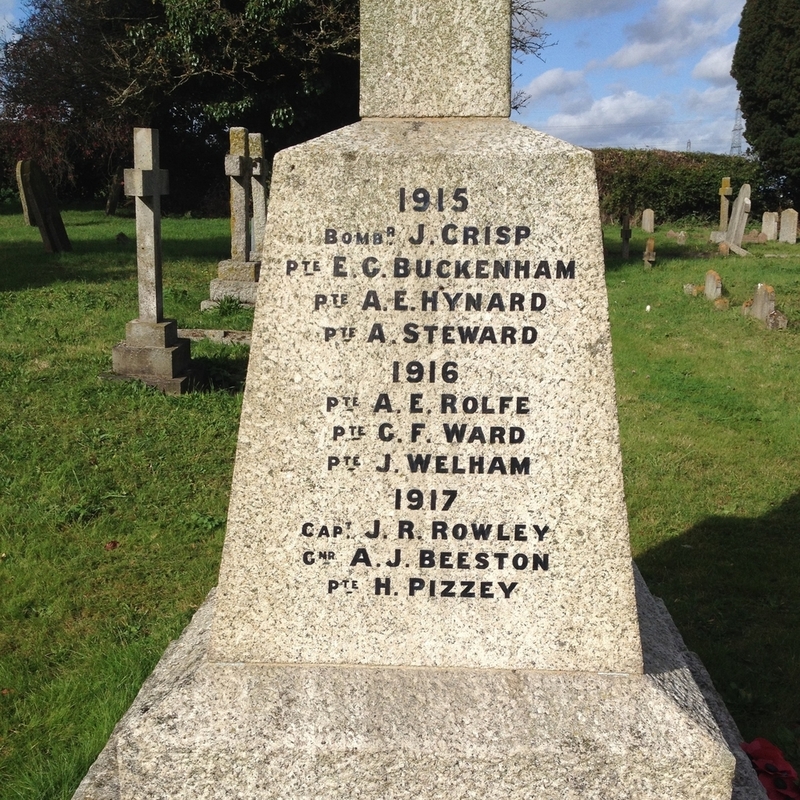 Evidence of this can be seen on the Layham war memorial, where two names appear that are also included on the Hadleigh war memorial. Given the close ties between town and village, the story of Layham's Great War will be included in this website. 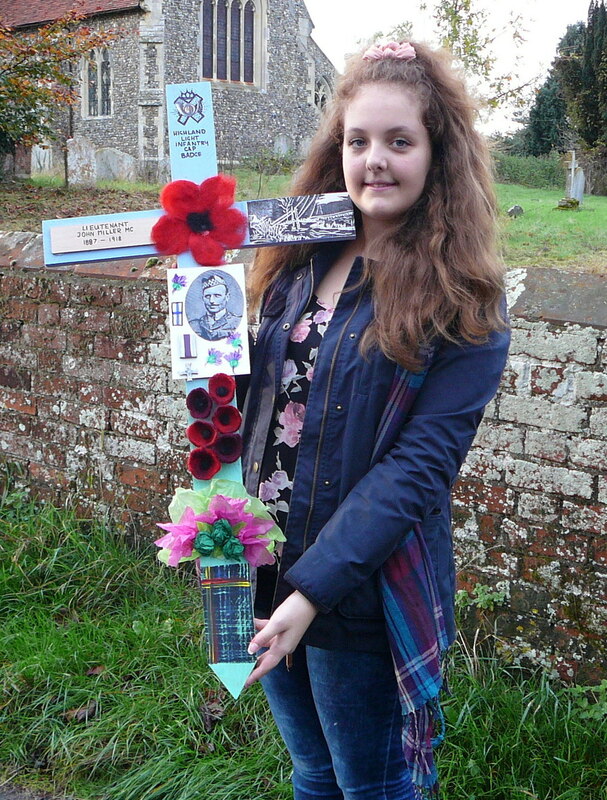 The Parish Council took the initiative to invite families of the men who lost their lives during WW1 to lay wreaths during the Remembrance Sunday ceremony on 9 November 2014. Families of nine of the nineteen men were traced and they all accepted the invitation – more than forty relatives being there on the day. Each family was given a copy of the book as a gift from the Parish. The ceremony around the war memorial followed the time-honoured pattern of the reading of the names of the village fallen, the two minutes silence and the laying of wreaths. 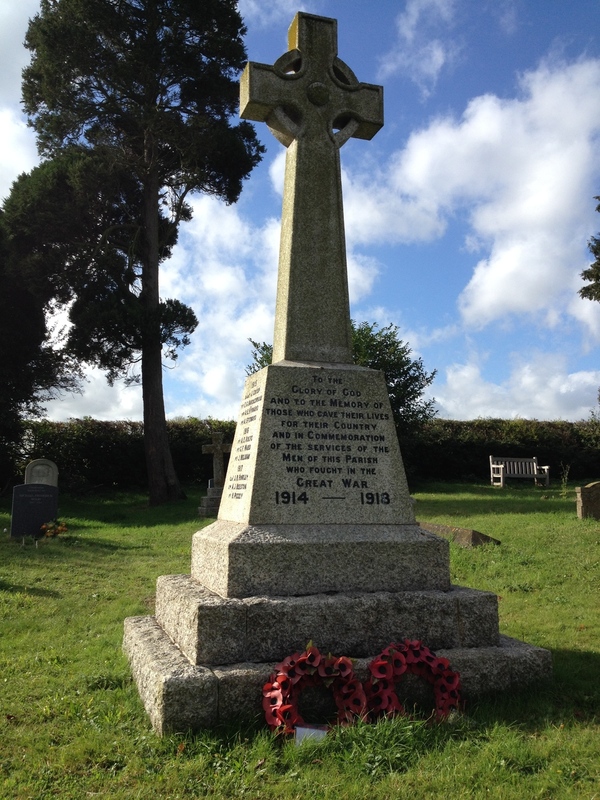 The book “Layham War Memorial: the stories behind the names”, researched and written by Michael Woods, has been published by the Parish Council. An enlarged version of the book was displayed along the walls of the church for three weeks following Remembrance Sunday 2014 and created much interest. The publication of the book, a copy of which has been lodged in St.Andrew’s Church, is to ensure that as much information as possible about the men named on the memorial is stored for ever and easily available to visitors. Following the laying of wreaths by the Clerk to the Parish Council and by a Churchwarden for the PCC in memory of all men named on the memorial, a representative of each family present placed individual wreaths. There was another dimension to the day which involved young people. 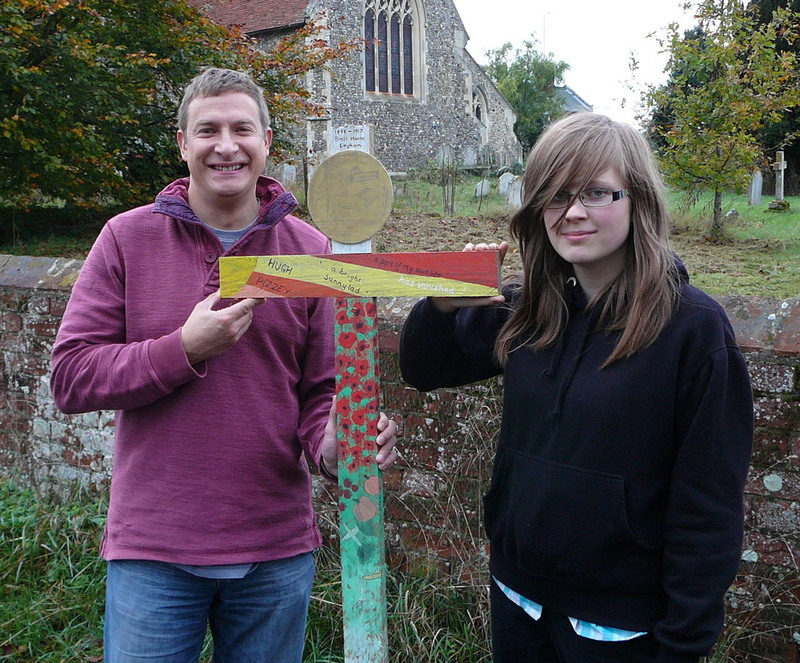 With the support of a grant from Babergh and Mid-Suffolk District Councils a volunteer group of five local teachers and artists (Victoria Reed, Julia Dawson, Sheila Roberts, Susie Jenkins and Michael Woods) ran a full-day art workshop for young people of the village in the village hall. The evening before the workshop, the film ‘War Horse’ was shown in the village hall and several of the workshop participants attended. 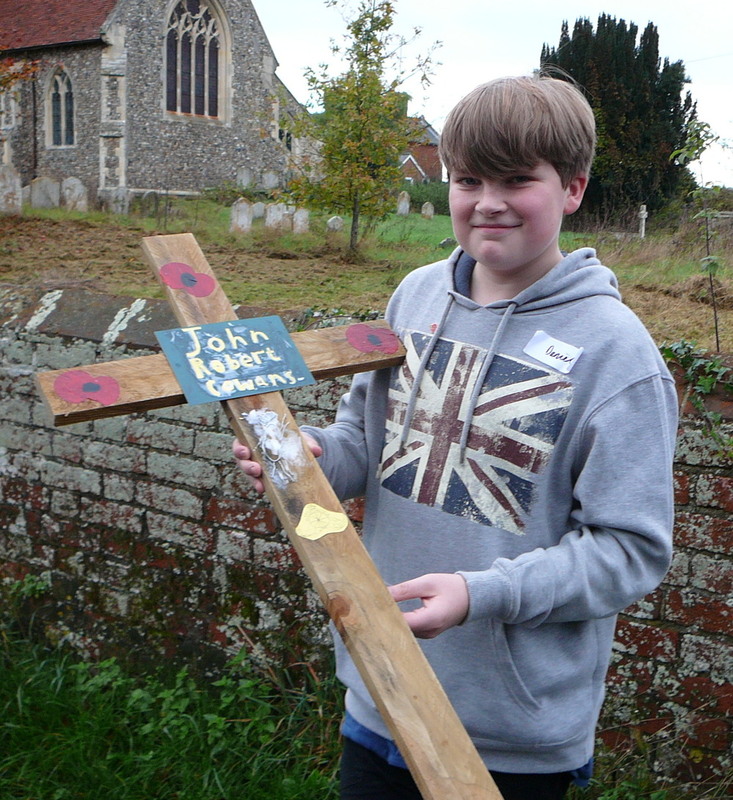 The finished crosses were used during the Remembrance Ceremony at the burial ground, where they were a point of focus for visiting families. The photographs below show the gathering taking place and the crosses being carried, after the ceremony, to the church of St Andrew. The crosses were then seen again in the service in St Andrew’s church when they were paraded into and through the church, accepted and blessed by the Rev. John Druce and placed around the altar. Most of the young people and many of their parents attended the service and were recognised for their interest and efforts by Rev. Druce. 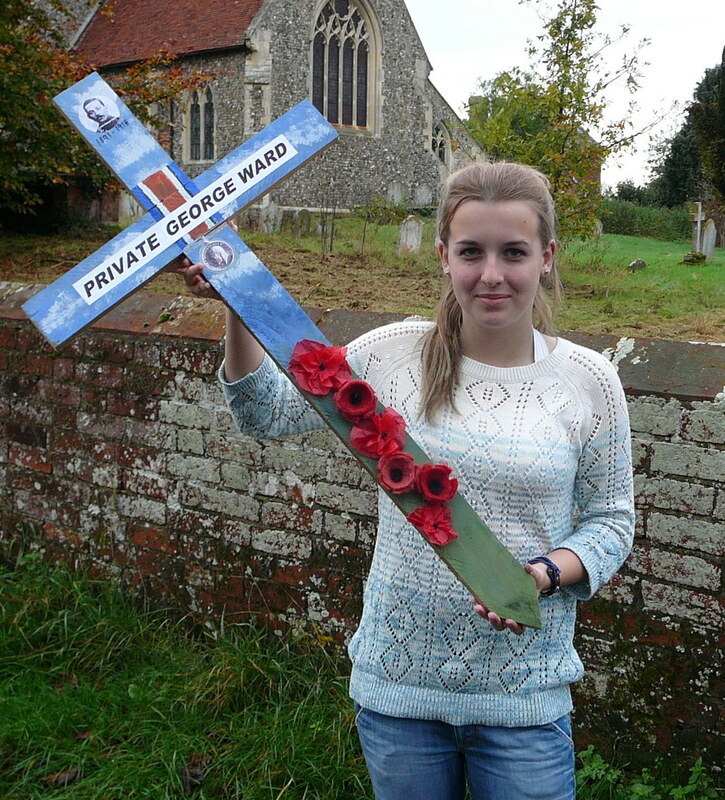 Nineteen young people and five parents of younger children then worked to embellish large wooden crosses – each one representing one of the names on our war memorial. The purpose of the workshop was primarily to engage young people in thinking about the stories of the lives of the men. They were stimulated with a slide show of life in Layham 100 years ago – helping to understand the context in which these men were taken away to fight for King and Country. They were also shown a range of powerful projected images of life (and death) on the battlefields. With these experiences behind them they worked to make the wooden crosses reflect, in some way, the experiences of the men. The outcomes were impressive and showed a real grasp of the subject.